If you have never been to Australia, you have probably never had a lamington. If you are an Australian (or are from New Zealand), you have probably had quite a lot of them. Lamingtons are an Australian snack cake consisting of squares of sponge cake dipped in a chocolate icing and rolled in desiccated coconut. Sometimes they have a layer of jam in the middle of the sponge. They were originally created as a way to use up leftover or stale sponge cake, because the chocolate coating will add and lock in moisture. The coconut is added because coconut is great. You could, I suppose, use chocolate sprinkles if you really cannot abide coconut. I would not try and pass this off as a lamington, though. The chocolate layer is not melted chocolate, but a mixture of milk, cocoa powder and confectioners sugar with a tiny bit of butter added for flavor. This glaze is easy to handle and firms up quickly. It is not greasy and makes the whole snack very easy to handle and transport. Judging from some of the greasy, dry lamingtons I’ve had, it is clear that some bakers have taken the “stale cake” idea to extremes. This is particularly apparent because lamingtons seem to be getting larger and it is significantly more difficult to choke down multiple mouthfuls of overly dry cake. They also seem to have enbraced the belief that using real chocolate, regardless of how much oil or shortening it is mixed with, is superior to the traditional icing, rendering the entire lamington greasy and difficult to handle. Grease and flour an 8″x8″ or 9″x9″ cake pan. Beat eggs until frothy with the salt. Gradually add the sugar and beat until light and at least doubled in volume, probably 10 minutes at medium-high speed. Sift together flour and baking powder. Gently fold flour mixture, followed by water and vanilla extract, into egg mixture until no streaks of flour remain. Pour into prepared pan. Bake for 20-25 minutes, until cake springs back when touched. Allow to cool for 10-15 minutes in the pan before turning it out to cool completely on a wire rack. Cut sponge cake into 16 squares, removing outer edges/crust, if desired. Combine all ingredients, except coconut, in a bowl and mix until smooth with a fork. Add a bit more milk if mixture is too thick. Dip squares in icing to coat. Let excess drip off, roll in coconut and set on a sheet of wax paper. Icing will be hard in 1-2 hours, depending on your climate. Lamingtons will keep for a week at room temperature. I’ve never heard of lamingtons before. Thanks so much for the recipe and post. I’m going to put it aside and pull it next time the Amazing Race goes to Australia. I love your blog! I love baking. I am always fantasizing about going to culinary school and enrolling in a pastry program. My family and friends are always getting homemade goodies whenever I see them. Thanks for all the great recipes you have posted. I am definitely going to try them. I am thinking of making the Lamingtons for my friend’s b-day next week. She loves chocolate. Is it better if I cut the outer crust and edge off before I dip it in chocolate? Does it affect the taste or appearance? Angela – I’m glad you’ve enjoying it – I hope you get to culinary school someday. These are great to take to a friend since they travel so well. I would recommend cutting off the outer edges (the parts of the cake that touch the sides of the pan) because they aren’t quite as soft as the rest of the cake and won’t absorb as much of the chocolate icing. It doesn’t affect the taste, though, so it really doesn’t matter too much. I would also recommend making the chocolate cake I posted about last week if your friend likes chocolate, since that is about a chocolatey as you can get! i read that they make the exact same cake in the midwest (ohio i think) and call it something else. Never heard of lamingtons before but seems a great idea for a finger-food cake. And you can do the cake ahead of time. Great. Ana – I agree that cakes that can be made in advance are very useful. Anonymous – It is possible that somewhere in the midwest they also have lamingtons, but I have never seen or heard of them there. IF this is true, please let me know where they have them; they probably imported the idea from Aus. Yum, I have not had lamingtons in ages, and have never had them home-made. I will surely give these a try. Beat eggs, adding sugar gradually, until fluffy. Boil milk and margarine until margarine melts. Stir in vanilla. Add dry ingredients to eggs and sugar, then add hot milk and margarine mixture. Pour into a greased, 9-by-13-inch pan. Bake at 350 degrees for 35 to 40 minutes. Cool. Combine all ingredients in a saucepan and bring to a boil. Cut cooled cake into bars. Dip in icing and roll in finely grated coconut. I imagine one could make this with a white cake mix and bought chocolate syrup that has been slightly thinned with a little water, but again, I haven’t tried. Bakeries in Cleveland make this delicacy with only a few variations. It is available with a chocolate-cake interior instead of a white-cake interior. It can also be made without any dairy products (which, according to recipe above, would just involve substituting for the milk in the cake batter). I do not know the specific origins of the coconut square. It certainly has been around for more than half a century, and at one time may have had a wider distribution in northern Ohio than it does today. My father, who grew up in Toledo in the 1940s and early 1950s, remembers coconut squares from his youth. The recipe e-mailed by my brother includes comments from individuals who grew up in Fremont and Akron indicating the item was once available in bakeries in those cities. Today, however, the coconut square is firmly associated with Cleveland. A box of Lax & Mandel coconut bars. 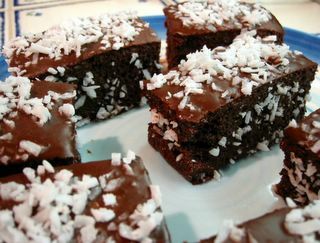 They’re smallish, stout oblong cakes entirely covered by a thin icing of chocolate and shredded coconut. Gram worked behind this bakery counter for more than forty years. She has gone to heaven and the block has gone to hell, but the coconut bars remain moist. I generally make it up to Cleveland a couple of times a year, and I always try to pick up some coconut squares to bring back to Columbus. Coconut squares are one Ohio delicacy that certainly deserve a wider appreciation. sorry, the above comment about coconut bars was copied from a website and was not posted by the author. Yay! Lamingtons on a US foodblog. Actually, I have to admit I haven’t had a lamington for quite a long time – you’re right, most bakeries do a poor job of them nowdays. I had a friend at school though, who made her own. I still use her buttercake recipe she used for them as my standard basic cake mix. Have you ever heard of Lamington Drives? They’re a traditional Aussie way of fundraising for community groups/girl guides etc. Basically they sell you packets of commercial lamingtons. A great Aussie tradition. Nosh – I hope they bring back good memories when you get to try them again! Niki – Nothing like a little cross-cultural cake appreciation! I’ve never heard of lamington drives, but I think it’s a cute idea. And I’m sure they sell a lot! I llllove lamingtons. It’s definitely on my list of top (food-related) things to miss about Australia. your’s look absolutely scrummy. I love your information on culinary school! I bookmarked your blog and will be back soon. If you want, check out my blog on culinary school secrets, please come by! hi my name is joel and i am from australia. you have made these lamgtons exatly the way that i make them here! But the picture of the lamingtons is not what they look like in real life!!! i sugest you go to google images and search “lamingtons”. Your lamingtons look nice, but I would suggest you roll it in more coconut next time. Traditional lamingtons soak up more of the chocolate, instead of it being like an outer coating of icing. Aside from that, they look delicious!! THAT’S NOT WHAT A LAMINGTON LOOKS LIKE!!!! Oh, and use Bob’s Red Mill unsulphured unsweetened coconut – it’s the perfect dessicated texture, very fine, if you bake your own! My mother was born in Australia – and I am 84 years old……Contrary to the above…lamingtons are made of spongecake (not yellow cake)….They are cubes (not squares) and are made of fresh spongecake (NOT stale cake)….they are frosted with rich chocolate frosting (or icing) and then rolled in very fine dessicated coconut. I have enjoyed these small cakes since I was a toddler….and am still enjoying them on a yearly basis….I still make them for my married children and many grandchildren….